If you are merchandising sporting goods and fishing gear, Refrigerated Live Bait In-Store Sales would seem the perfect cross sell and adjacency. In this case, no highly specialized equipment required. Just a standard refrigerator to keep the bait fresh and a sign. I might have suggested a larger and fancier sign, but the refrigerator was prominently positioned facing Fishing, so maybe all is well. Look close to see that Wax Worms are on the menu, but they are the caterpillar-like larvae of the Wax Moth, not artificial bee’s wax imitations of bait. These are the real thing. 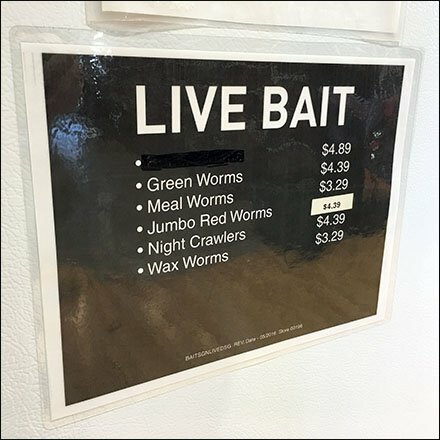 Consider this Refrigerated Live Bait In-Store Sales for your next angling excursion. Located in Discl’s Sporting Goods, Rockaway TownSquare Mall, Morris County, NJ.